Eighteen faithful hens, some very old, from our original, first flock. 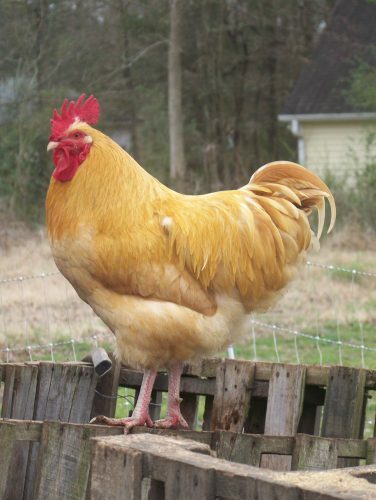 One beautiful Buff Orpington rooster: Captain Fluffybutt! It was all my fault. I cared too much! February 15, 2015: it was really cold, about 5 degrees. It was also really windy, and it had been dry for a long time. Surely they needed an additional heat source, right? At least enough to keep their water from freezing? Sure, I thought. So I mounted the heat lamp lower to the ground than usual, closer to the waterer. I hadn’t properly appreciated the danger of sparking a chicken coop fire with the heat lamp I was trying to use to help our beloved flock. My family had enjoyed having a backyard flock of chickens for about 6 years. We had kept some beautiful birds, lost some wonderful pets, integrated “rescue” hens, and had an “eco-loop” system for our micro-farm that included the amazing compost produced by these birds. Our chickens were an integral part of our lives. We loved them, cared for them, and they cared for us. Some of our wonderful hens! Captain Fluffybutt – so regal! 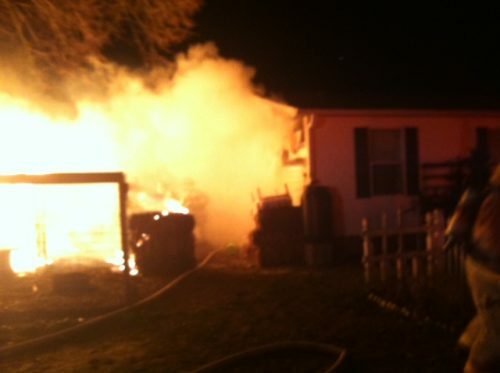 We ran outside to see the chicken coop fire: it was completely engulfed in flames. It was so hot; it was huge. I never knew the power of fire until that moment. I realized that I couldn’t even get close enough to open the coop door without getting burned myself. There was nothing I could do. I was helpless. All I could do is watch. No hose nearby, not enough time to turn on the water and drag the hose up to the coop. The water in the water harvesting barrels was frozen solid. But something had to be done; if we didn’t put out that fire quickly, the house would catch on fire, and that was unthinkable. The siding on our house was lost, but thankfully the house itself did not catch on fire. All those thoughts took a microsecond in my head. I grabbed my cell phone and dialed 911. We’re just a mile from our local fire station. We heard the sirens getting closer—slowly—and louder—slowly—and we watched the siding on the house melt, watched the chicken coop fire spread across the ground toward the house. I stomped on the smaller, creeping flames. How long does it take a fire truck to travel ONE mile??? An eternity, when your life is going down in flames. My traumatized kids were herded out of the house into our van. We moved the van into a neighbor’s driveway and tried to warm it up as fast as possible. My 5 adopted kids – each with their own adoption-related issues and diagnoses to deal with—watched it all from across the street. What were they thinking? FINALLY the big red trucks arrived. 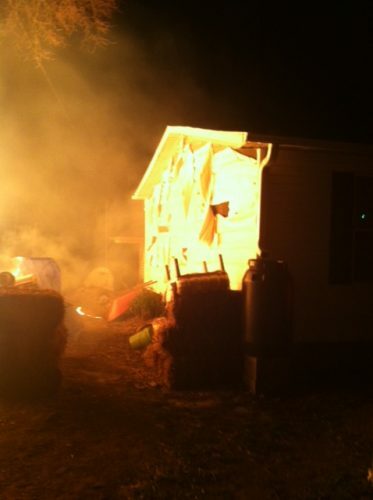 And after some haggling with the hoses, the chicken coop fire was out in seconds. Firefighters are heroes. They literally saved the day. Steam rises as firefighters begin putting out the fire. That was the end of the fire, but the beginning of a year and a half—even 2 years—of cleaning up, rebuilding our lives, and beginning again with chickens. I haven’t even really gardened since then. Not like before. Even writing this blog is an act of rebuilding. 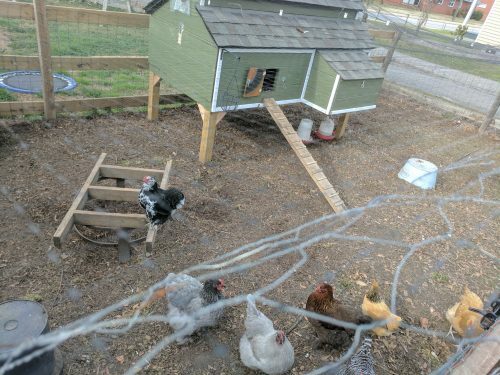 Sure, we got our new flock of chicks from My Pet Chicken in August of 2016 and they’re amazing: 13 colorful birds from 13 different breeds and colors… but do I LOVE them like I loved that old flock? Honestly? No. At least not yet. It’s painful; it hurts. I can HAVE chickens, but if I REINVEST myself, I open myself up to more pain: the pain of loss. Love = potential pain. It’s easier to run from love, to harden, to avoid, to say, “Those are my wife’s chickens,” or “they’re just birds,” and run from vulnerability. But when we do that, something inside us dies. 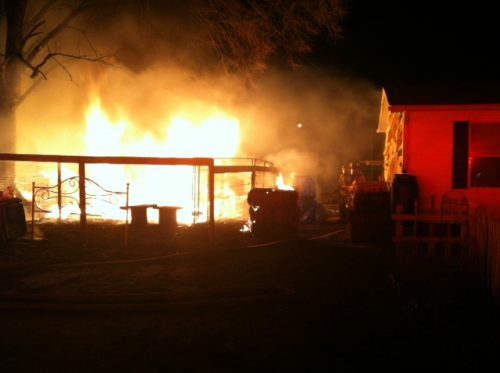 That long-dead chicken coop fire can kill a still kill a part of YOU, too. If you let it. And I won’t. I can’t! Writing this blog post is part of the healing. Just putting the pain in print is cathartic. I’ve resisted writing it for a year. 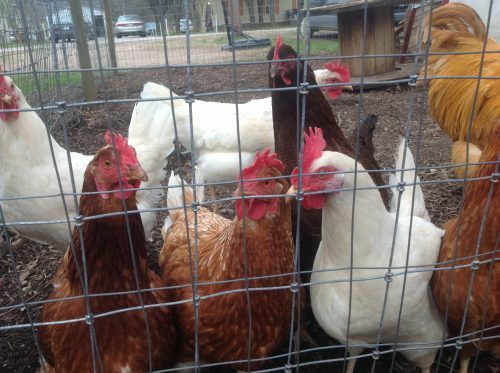 A YEAR of wondering, why can’t I blog about chickens? Why do I feel blocked? I’ve helped hundreds of customers with THEIR love of chickens for over a year, but I’ve been afraid to really care about these birds again for myself. I’m writing this blog to say I’m starting again. Starting again to love my flock, love the living things around me, in spite of the fear of loss, the potential pain. Our new set-up, with beautiful birds from My Pet Chicken! So sorry for you loss. It is such a gut wrenching feeling. We went through the almost exact thing last year. The only difference was that we were woke up at 5 am by people knocking on our front and back doors trying to let us know our coop was on fire. I ran out back and just stood there in tears thinking of all my feather babies and what there last moments were like. I’ve had a lot of anti heat lamp conversations with chicken owners since then. If I can keep one from going through that I will be great full! Thanks so much for writing this Tim, it’s so tough to deal with losses in our flocks. Reading about your tragedy also helps shore up my willpower to avoid the heat lamp during these cold snaps of weather. So sorry, but, we all make mistakes in life…at least it was not a human life. I am so sorry for your loss. I am in the process of getting my own flock. My mother has 8 chickens and they are all pets. All named with different personality. I can only imagine what you have gone through. I wish you peace. HUGS. I can only imagine your pain but you are right…it is better to love than not to because of the fear of losing them. Good for you for starting over. There are too many feathered babies that need the love you have to give them. So sorry about your loss. I had a similar feeling when my ckickens were killed by a red fox, which I didn’t know was around last year. It was my first year of raising chickens in my backyard. I’m so sorry. My chickens are like my children, my heart goes out to you. I’m sorry for your loss. This is a very important message that you’ve gotten out there and it may very well be an important preventive for someone else. I lost my 130 year old historical barn in the central Hill Country of Texas one year ago due to a red bulb heat lamp problem. Just 3 chicks were under that bulb but I also had 9 ducks in there. I checked the lamp and the chicks 3 times before I went to bed at midnight but something happened and at 5:45 A.M. it was almost fully engulfed in flames. I was able to get the ducks out and my nearby chicken coop didn’t catch fire. Afterwards, I kept thinking there has to be a safer heater. I recently ordered the SWEETER HEATER from M.P.C. and it is the perfect answer!!! I had resisted buying it because it is much more expensive but IT IS WORTH THE PRICE!! Please! It is a matter of safety. I feel secure using it with my little ones because it provides gentle heat with out exposed bulbs that could catch bedding on fire. I can’t replace my historical barn and was fortunate not to lose my house and coop but I am still recovering emotionally and financially. At least I can rest easy with my wonderful Sweeter Heater!! Thank you so much for your kinds, understanding thoughts. You’re right; that was perhaps the most difficult thing I’ve ever had to write, but I obviously NEEDED to write it. It was cathartic, and released a flood of creativity after I wrote it. I was truly “blocked” before, but actually putting my negative feelings into words released their hold on me. Expressing our pain in healthy ways can have beneficial outcomes. Thanks again for your kindness and for responding to the blog. I’m so very sorry for your terrible loss 🙁 I am just in the preparation stages of beginning “The Chicken Saga” era of my life and while I don’t yet have my girls, I have dogs and know that bond we have with our beloved furry, fluffy and feathered friends and know I’d be absolutely devastated should something like this ever happen. I’m glad you are beginning the healing process and were able to try again. It’s going to be difficult, but I hope by now you’ve made peace with it and are able to bond with “the wife’s chickens” and make them your own. Peace to you…..